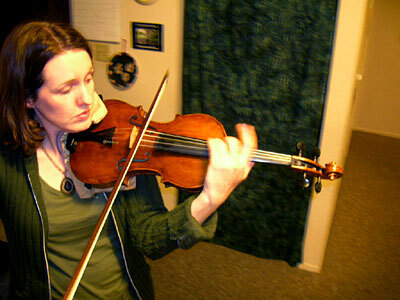 February 14, 2007, 11:28 PM · As of this month, I've been playing the violin for 30 years. My violin anniversary is February 18, to be specific. I know because I started on Melanie Mayer's ninth birthday, as did Melanie. She reminded me every year. So wherever you are, happy birthday, Melanie! I've been playing on an excellent violin now for one year, and it has opened my mind in ways that nothing else could in the 29 years before. That's right, my nine years of violin instruction before college, four years in college, two years in graduate school, years of performing in dozens of orchestras, solo recitals, not to mention literally thousands of hours in the practice room – none of it taught me what a good violin has taught me. One sees this phenomenon in small children: the child with a quarter-size violin who is ready for vibrato, for example. The child can do vibrato, even, but neglects it because he or she can't see the point. Then the child gets a larger violin that resonates, and suddenly vibrato makes sense and he or she can learn it. The highest violin technique makes sense only on a fine instrument. I've been looking back at pieces I played in college and reading the notes my teachers wrote in the margins. At the time, I played on a German factory violin given to me by my grandmother; it had been in her attic. For all her good intentions, though, it was a squeakbox. "More tone!" implores my teacher from the page of a Brahms sonata. "SUSTAIN" in the last movement of the Saint-Saens concerto. "Darker sound on the G string" was a comment in a Bartok piece. Even "LOUD" at the end of the Andante melanconico in Intro and Rondo Capricc. Certainly there were requests that had more to do with the player than the instrument ("Stand straight! Relax left hand!") but I also saw much begging for a sound that simply was not possible or that took such heroic effort. I worked and worked and worked to make those things happen, and still the results were marginal. I barely have to do anything to make more tone, or a darker sound, on my current violin. Without having ever played a fine violin, I did not even understand the completely different plane of playing available to me. I understand now why some conservatories and universities make fine instruments available to students. I used to think that if one played well on a bad violin, one would be way ahead of the game when stepping up to a better one. That if one was "spoiled," playing on a Strad in college, one would never figure out how to make do with something lesser. It's not true. If one plays on a fine instrument, one knows what to seek in any instrument, and one also knows its importance. All those years of fighting a bad instrument cause frustration; they block out what could be; they prevent the exploration of one's fullest potential as a musician. I am grateful to at last have an instrument that allows me this; even if I'm destined to be a very late bloomer! But I would implore parents, schools and young musicians themselves: get the best instrument you can. Get the one that will awaken you to your fullest potential! February 15, 2007 at 06:54 AM · Amen Laurie! Just a 2 years my teacher and I finally came to realization that we could just not get any more out of my existing viola. It was to the point of trying to squeeze blood out of a rock - her playing it, me playing it - didn't make a difference. Now with a higher-end viola, it :::gasps::: RESONATES! New viola in tow, I'm starting on page one so to speak to bring out the music that was muffled. Happy VDay! February 15, 2007 at 06:51 AM · Oh how I agree with you Laurie. While not wanting to blame everything on my violin, I do remember teachers imploring me for more tone, brighter sound, and said I played everything mezzo-piano. Recently I bought back my childhood violin from my sister's attic, and there is no comparison with what I'm playing today. My childhood violin is muted, very dark and has no sustain. Even today, I'm outgrowing my new violin. One that I absolutely loved 3 years ago is seeming to be too clinical to me now. Yes, it plays every note beautifully, and it is ringing and resonant, but everything is a little too perfect, and there is no room for expressiveness, or at least I have to work too hard for it. It works for Bach and Mozart, maybe even Mendelssohn and Beethoven (stretching). But now my teacher is asking for me to play Russian pieces, and there needs to be more soul and variation of tone easily produced by slight changes of bow sounding point, weight, pressure, speed. Fortunately I have another instrument that is responding to this need. But I'm really scared of what I may find if I try a truly fine violin (that has also an astronomical price). February 15, 2007 at 12:10 PM · This post really resonates with me (so to speak). My violin is still the one I played in high school, and it has similar issues to your German factory violin. It may even be one of those itself; I don't know where it came from before my teacher got hold of it in 1978. I rented a high-end viola last year, and even with my relatively lesser viola skills, the difference between the two instruments is like night and day. I'm planning to buy a viola soon, and maybe a violin in a few years, but I'm nervous about both. I want the kind of instrument you write about--one that will teach me to reach new things--but I'm afraid of making a several-thousand-dollar mistake. February 15, 2007 at 01:25 PM · Getting used to some fine instruments is like a series of revelations, like Ah, I know that sound...so this is how making it feels. It's a lot easier I think to apply that knowledge down to a lesser instrument than to "get it" with a lesser one, and produce a fine sound on it. February 15, 2007 at 02:16 PM · You tooooo!!!! I was just thinking the same thing... next month it will be 31 years of playing the violin! Time goes by fast. Congratulations... keep up the great work! February 15, 2007 at 04:07 PM · Eloquently spoken, Laurie, and conforms 100% with my own experience. It also brought back an incident from my childhood. When I was around 8, a couple of years after starting the violin, a famous violinist was visiting at our house. My parents had me play for him, on a wretched 3/4 size "piece of kindling" (as my son would call it). With a pained expression on his face, and more in sorrow than in anger (as my father put it when he often retold this story), he turned to my parents and said: "This instrument is hard enough. Get the boy a decent violin." February 15, 2007 at 04:27 PM · So true!!! Luckily my teacher realized that while I was playing my student violin...I started playing on one of his violins and was totally shocked by the differences I could get out of it and the power it had!!! February 15, 2007 at 05:00 PM · Laurie, I'm so glad you wrote that.. It is so true. I get beginning students who tell me very proudly that they did some research and bought a very good violin on the Internet (ebay or elsewhere) for only $100. They try to leanr to play it, and they sound so bad that they give up. I often refer people to a local store that rents beginner violins for $25 for three months, but i tell them that they will outgrow it in three months and I'll help them get a better one at a reasonable price, renting with the option to buy. i only do this because a lot of people, including adults and kids, take a few lessons and lose interest. One of mystudents, an adult beginner who has been playing for about two months, got some windfall income and went to a good violin store. He bought a wonderful violin for $1200 stricyly on the advice of one of the violinists who worked there. She played several violins in that price range and chose one for him that plays easily. It sounds wonderful. I'm fortunate that the violin that I got when I started playing a full size is a relatively good one. My family could not possibly have afforded such a good instrument, so my violin teacher (bless him!) gave me one of his on a long term loan, and my father paid for it bit by bit for years (bless him, too). My recent personal experience is like yours, although I've never played a really good violin like yours. Every time I try another violin or bow that's better than mine, I'm amazed because I sound so good with so little effort. It's as though the concept of the sound I want to make goes from my brain or heart directly to my violin without passing through my hands. Laurie, you don't look anywhere near as old as you are. February 15, 2007 at 05:36 PM · Good post and so true. Laurie, who made your wonderful violin? February 15, 2007 at 07:03 PM · Laurie, your post should be read by more players out there.As an amateur of many years playing in orchestras, I'm amazed at the poor quality of instruments people are playing on.It's not about lack of money but about lack of knowledge on this whole subject of what a decent instrument can do for your playing....Say hello to your beautiful Gagliano for me! February 15, 2007 at 07:19 PM · Actually, my daughter and I are lucky enough to have "hand-me-down" old violins that although rather battered, have good sound (especially mine!). I'm spending quite a bit on restoration work these days. I just had a new fingerboard put on my daughter's violin, and she had a very nice loaner from the shop during the repair (a violin worth more than $10,000), but she found that her older, battered one simply sounded better. Meanwhile, my poor old battered Mittenwald, with the plethora of repaired cracks, the completely worn out edges, and the pegs that need re-bushing gets lovingly played - I love the sound! I just wish I had the money to fix some of the above things. Somebody should ALSO state that a good bow makes a huge difference, as well. I had a horribly warped bow, and Chrismas 2005 I received a new, much better pernambuco bow. Personnel from the violin shop who play picked it out for me. What a difference! I couldn't believe what that new bow allowed me to do that the old one simply couldn't. February 15, 2007 at 07:23 PM · I think it is up to a teacher to point it out, if a student's violin is becoming a major hindrance to progress. It's a tough subject if a student clearly can't afford anything better, and that was my understanding, that I could not afford anything better. And yet, I see now that if one chooses a life in music, one can't afford NOT to have an appropriate instrument. My violin was made by a Gagliano brother, though I don't know which one! We joke that it was "Jose". February 15, 2007 at 07:25 PM · Wonderfully stated!! I just recently purchased a fine violin from a wonderful maker in my area. I am so happy with the violin and sound so much better than I ever have. It is amazing what a better quality instrument can do to you. All I think about all day is when can I play? When can I practice? I have an 18 month-old daughter and can't play as much as I would like, but I think about my violin all the time. I feel like I wasted so much time with my old violin. By the way, from what I can see in the picture, your violin is beautiful. February 15, 2007 at 07:39 PM · I agree totally that people should be aware of the difference that a good instrument makes. But I would encourage folks "in the know" to tread lightly and sensitively in this area. Even putting financial considerations aside (which can be hard for many), people can become attached to their instruments, and a "clever" but thoughtless criticism of a someone's beloved violin may not have the desired effect. To take a couple of examples from this thread, "kindling" and "squeakbox" are funny, but they can also hurt. February 15, 2007 at 07:58 PM · It is, indeed, a wonderful looking instrument. It'a also true that the Gagliano family made some superb violins that are used by professionals everywhere. February 15, 2007 at 09:17 PM · Charles, I got mine from Barry Hou at Marquis Violins, if you look on the Violin Shops page, he is a sponsor of Violinist.com. Also, there are many, many dealers in California if you look in the Violin Shops page. couldn@t agree more. I sometimes wonder about parents who cheerfully support kids with decent bikes, fishing rods, gold clubs etc. But when it comes ot the violin any old junk will do. Incidentally, the bow for me is evrybidt as fundamnel in the same sense. February 16, 2007 at 12:52 AM · Fantastic article! I am nowhere near your experience level (i've been playing for slightly over one year), but have stepped up to a better violin and it sounds 1000% better than my student level instrument (which cost $369, and that included the case and bow!). By playing this new violin (Scott Cao STV-850) didn't make me a better player, but inspires me to play more because of the beautiful sound. February 16, 2007 at 04:44 AM · This really makes me want a new violin! I have a pretty nice one; it was about $2,500, but people in my orchestra and my other programs have violins ranging from $5,000 - $18,000! February 16, 2007 at 06:53 AM · The thing that bothers me is the parents. They drive Benz's and then brag about buying a $30 + shipping violin on Ebay with rubbery strings. Every lesson they pay more than they paid for the violin, and then they wonder why their child hates to practice or can't make a decent sound. It's some kind of cruel trick to make someone practice on that kind of instrument! Incidentally, I always try and play my son's fractionals to see if I myself can stand it. While I'm not getting him a benchmade fractional, I'm at least getting him something playable and with a good tone and response. This way he can make a good sound if he wants to. February 16, 2007 at 01:15 PM · Well, there are also a lot of parents who don't drive Benz's . . . and from their point of view it can be hard to know how to allocate limited resources, especially when a kid is just starting out and may or may not stick with the violin. And there are also the proverbial Benz-driving parents who buy their 11-year-olds $5000 instruments that they don't appreciate. I think there is value to the notion that fine instruments are something to be earned, a reward for hard work and a serious commitment. February 16, 2007 at 09:34 PM · Well I was only talking about the parents who do drive expensive cars. Obviously we have to get what's within our budget. I know my dad stretched to get mine and I'm grateful for that. However if the parent wants to get an expensive violin for a child, all power to them, I'm not jealous either. The point is that the violin can be a limiting factor in someone's development. By the way, playable and responsive does not always mean expensive. You just have to know where to look and how to judge a violin. Teachers can help in this respect. February 17, 2007 at 12:18 AM · Claire, I agree. Someone like Laurie, or a college student studying music, has totally earned the best instrument they can get and then some. I grew up on the other extreme--with a cheap, crummy factory instrument for years--and I resented it back then. On the other hand, if I look objectively at my family's resources and what they nonetheless managed to contribute to my musical education, that's reason for gratitude enough. February 17, 2007 at 04:05 PM · Great article! Thanks for the great info and advices, including those in the various comments. Like many others here, I've been learning about this theme/topic since the kids and I started taking up the violin nearly a year ago. We started my then-7-yo daughter on a decent 1/4-size violin from a way-out-of-town shop that our teacher recommended (for good value as well as good instruments). Still, I decided I should learn more and not merely rely on our teacher as the only resource/help on the matter, so I've been spending plenty of time on the net doing my homework -- on top of learning the violin myself as I've always wanted try it, which works out great w/ the Suzuki method anyway. No, we don't drive a Mercedez -- heck, we only share a cheap though relatively new Saturn w/ our in-laws, lol, as we really don't need an expensive, new car here in Brooklyn, NY, even though we're one of the very few in the neighborhood w/ our own little garage. :-) While other folks, including some friends and even family, drive their Mercedez, BMWs, Lexus or whatever else, we'd rather put the $$$ where it really counts IMHO. Still, it's gonna hurt if/when we someday find that we'll have to shell out the big bucks for truly fine instruments for the kids. For now, we have our daughter on a 1/2-size German-made John Juzek from the 1950's (w/ another 3/4-size one in the waiting) that I managed to buy off eBay for much less than the previous 1/4-size. It could probably use some all-around refinement including a lower bridge -- that I plan to replace shortly -- but seems to be quite good w/ plenty of power and projection and a fair bit of warmth and open sweet tone (that seems to come w/ age) otherwise. She used to get completely drowned out by the other older kids (w/ their 3/4-to-full size violins) in her group class, but now, I can hear her just about as easily as the couple kids w/ full size violins -- the sound even comes reasonably close to our teacher's travel/teaching violin though hers has had a major accident and is no longer quite as good as it used to be. If any parent is on a tight budget and really want to get a decent violin off eBay, I would certainly throw in my 2 cents worth of recommendation for vintage Juzek instruments -- though most of the ones on eBay may not win any beauty contests and will probably need to have some proper setup work done, including good new strings, possibly new bridge and maybe also soundpost adjustment. Alternatively, if the budget is not quite as tight, there are some good values to be had in some online shops too. For my own playing, I've been buying some Juzek instruments off eBay as well. Currently, I have a 1966 Juzek Master Art violin that's substantially better than the ~$350 beginner's violin I started w/ -- that one is actually not bad for the price, but is totally lacking of nuiance and refinement in its otherwise quite loud tone that sometimes sounds warm enough w/ a certain beauty to it and more often than not way too shrill and harsh. I also bought a much older Juzek (along w/ a nice in-need-of-repair bow) at a great bargain price that unfortunately got a very long crack from a poor shipping job :-( and is waiting to be repaired/restored hopefully to nearly what it could've been. And there are others like a pair of 16" Juzek Master Art violas of different vintages that I bought at great bargain prices -- I especially love the very resonant cello-like sound of the 1948 one I just received. February 17, 2007 at 11:02 PM · Thank you for an interesting blog. For those who experienced violin "upgrades" will know exactly what you are explaining. I had 2 upgrades so far. The first being temporary before I got the violin I'm playing now. A good violin will make you want to play and not let it go! I love my violin, but I know it is not the "ultimate" instrument I want. Like usual, I reward myself when I pass my exams (studies or music). Mid next year, if I pass Grade 8 with honours (A) or higher (A+), I will reward myself with another upgrade. Hopefully there will be an instrument around I will love even more. If not, I will wait until I pass AMuS.